Ever since I saw these Flipit ads in the back of Gold Key comics in the late seventies, I've been intrigued by what they looked like. I've never seen them at shows in my travels so I finally sought one out through ebay for the mere purpose of satiating my curiousity. Being it's Halloween, the logical choice was Frankenstein, if you've ever wanted to see what you got for your buck join me after the jump. Yep, that's it. It's exactly as described, a balloon, a bag with Frankenstein printed on it and some cardboard feet you punch out of the backer. I will admit I'd be pretty ticked paying a dollar for something that has $0.69 printed on it (although I guess I paid $20 for exactly that but I digress) but there she be, kind of neat, rather large and another mystery solved. 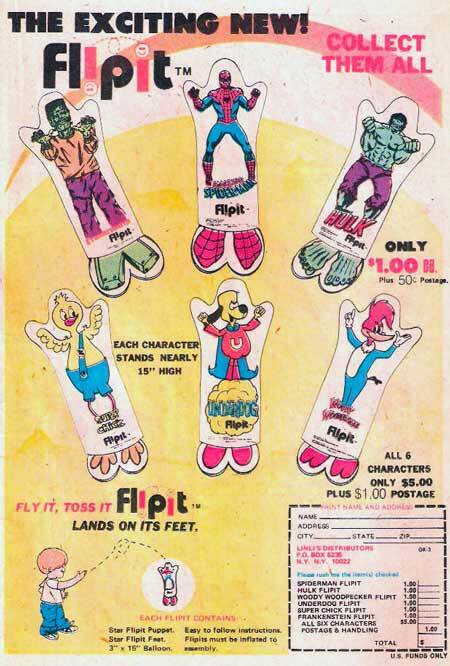 I had the Spider-Man and Hulk flip-its and they were as much fun to play as a balloon attached to a piece of card board can be...which is not very much.